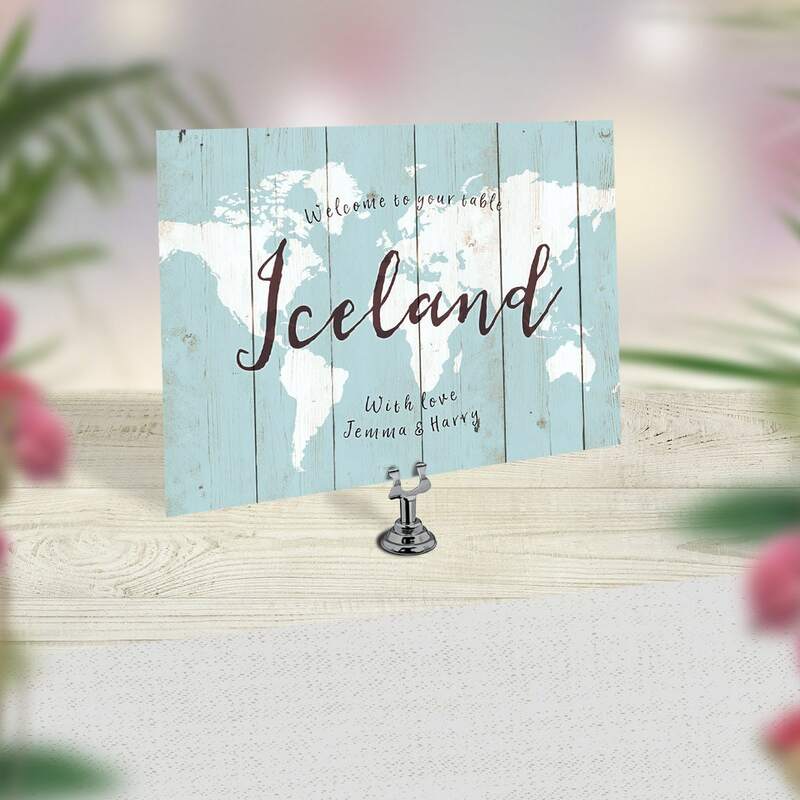 All place names are fully customisable and you can have any place/location on the cards. You could use all of the places you have visited together, your favourite restaurants, or street names in the places that are special to you. The travel theme wedding table names are perfect for travel lovers' weddings and a fun way to include your love for travel on your big day. Our example images show New York but you can choose any place or location that is special to you. 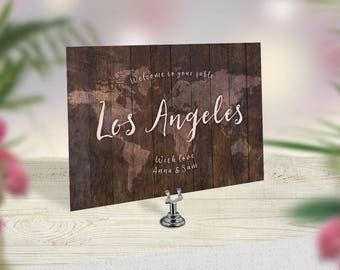 The wording shown, such as 'Welcome to your table', or With love' can be changed or removed to suit your event. ● Choose from a completed digital file to print yourself, or we will print on 350gsm quality smooth matt card. ● Please take note of the turnaround time for this item which can be found in the Shipping section. Please note that turnaround time excludes delivery time. To personalise your order please enter the details into the small text box on the cart page / send the details in an Etsy conversation message / or email the details directly to us at contact @ noordinaryemporium.com (remove spaces).. Please include your order number for reference. ● Table Card Options. 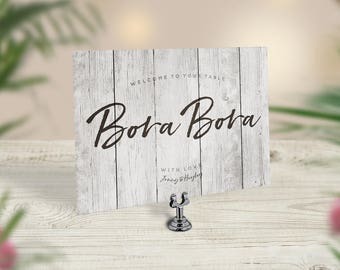 Cards can be printed in the sizes below or as a digital file. ~The size you intend to print at e.g. 5x7in, A5, A6. ~Digital files will be created in 5 -7 business days. We have a rush option available in the Options & Upgrades section. ~Use the code DIGITAL in the coupon code box at checkout to remove the shipping cost. ~Please note the digital file we supply is ready for printing and is not be editable. ~The file is a PDF at 300dpi high-resolution and in CMYK colour format. If you require an alternative format please let us know. ~We provide the completed file via a DropBox link, where you can download the file directly to your device. Files are available for 3 months after the purchase date, so please ensure that you download the file promptly. If you have any questions, please do ask. ● After receiving your order and the details required to create them, we will work on the design within the processing times shown. ● As soon as your draft design is ready to see we will send a digital image for you to check over. ● Included in the purchase price are two rounds of revisions to wording or minor changes to the design. Additional changes or significant design changes will be charged an additional fee.Extra changes will have an additional fee. ● Once you have approved your draft image we will prepare the design and add to the queue for printing. ● Orders will be shipped before the end of the processing time, or sooner if you have already agreed an earlier dispatch or rush option. ● Standard delivery: Royal Mail First Class Signed For. A signature is required upon delivery. ● Royal Mail Tracked: After the item is dispatched, Royal Mail will aim to deliver the next working day. Please note that Tracked is not guaranteed to be delivered next day. ● Royal Mail Special Delivery 1pm: After the item is dispatched, Royal Mail aim to deliver the next working day. ● DPD Next Day: After the item is dispatched, DPD aim to deliver the next working day. ● UKMail / DHL Express: The delivery aim is between 3 - 6 days, depending on your location, check on the cart page for a clearer delivery time. Please provide a contact telephone number when ordering, for delivery purposes only. Please note that we are unable to post to Military addresses, due to courier restrictions. ● Please take note of the processing times (the time it takes to create the item). The processing times can be found in the Shipping section where it says 'Ready to ship in'. This excludes delivery time. ● Please note that printed colours may vary slightly to what you see on your screen as all screens are set up differently. ● Please note that no changes can be made to an order once it has been approved for printing. ● Please read our frequently asked questions section for some more helpful info. 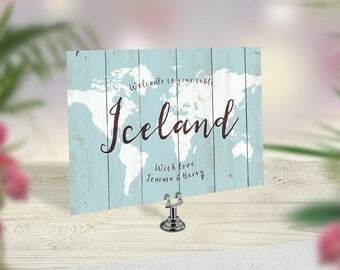 Thank you for your interest in our wedding stationery, custom travel maps and journals. Perfect, just what I wanted, great feedback and even the packaging was wonderful. Looked great, and our guests loved the idea. The shop was very flexible with customizations. The shop owner was very quick and worked with me to get the names as I wanted them! Quick shipping too.